Through Ami's Eyes. : Halloween Party time with PJ Masks!! Halloween Party time with PJ Masks!! As you may or may not know, Bubba is a massive fan of PJ masks (remember the video of him singing the theme tune from this post??) 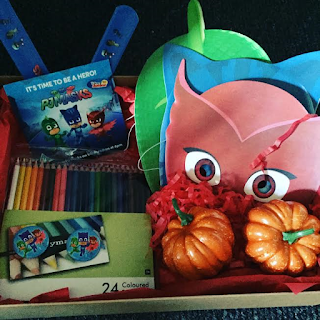 and recently we were sent a very exciting pack to help us celebrate Halloween and the launch of some brand new PJ masks episodes coming to Disney Junior on 31st October!! For those of you who don't already know, PJ Masks is an animated television series that revolves around three 6 year old children who lead a normal life by day, but when they put their PJs on and activate their bracelets they become the PJ masks. The show follows Owlette, Cat Boy and Gekko on their journeys to go ''Into the night to save the day!!''. If I'm being honest, even as a parent it's a pretty good show and one even I don't mind watching :) Bubba LOVES it and was pretty excited when we got our special PJ Masks Halloween Kit through the other day. We invited a couple of Bubba's friends round and got set up to have a little Halloween party PJ Masks style! In our amazing pack we were sent some super PJ Masks masks (which the kids weren't that good at wearing to be honest!!) and some pencils and brilliant pintables that the kids really enjoyed colouring in. We were also sent some yummy treats that I suppose we could have kept for trick or treaters but they were too good looking so we shared them at the party! We also got a PJ Mask DVD which we put on as background music and it made me get very excited about the new series starting!!! In our pack we also had a note which told us about a fantastic new PJ Masks app called Super City run that will be flying onto mobile devises on 30th November. Overall, we had a great afternoon at our PJ Masks Halloween and can't wait for the new series to come out!!! 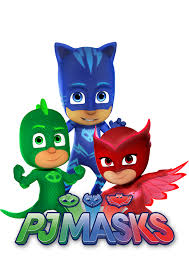 You can catch PJ Masks on Disney Junior and check out their website here!